FILE - Victor Cha, at the time the U.S. National Security Council's director for Asian Affairs in the George W. Bush White House, is seen walking through a hotel lobby in Beijing, China, March 22, 2007. Cha is reportedly under consideration for the post of U.S. ambassador to Seoul. U.S. President Donald Trump reportedly will soon nominate Georgetown University professor Victor Cha for ambassador to South Korea. The addition of the highly qualified North Korea expert would fill an important diplomatic vacancy needed to manage what seems to be significant disagreements between Washington and Seoul over how to deal with the North’s increasingly provocative nuclear and missile tests. Cha, who is Korean-American, is the director of Asian studies at Georgetown University, and the Korea Chair at the Center for Strategic and International Studies in Washington. He was also deputy head of the U.S. delegation to the North Korea nuclear six-party talks during the administration of former President George W. Bush, and the author of a number analytical books on Asian security, including The Impossible State: North Korea, Past and Future, that was published in 2012. Testifying before the Senate Armed Services Committee in April, Cha voiced concern over rising support in South Korea for pursuing increased cooperation, aid and economic incentive polices with North Korea to reduce tensions and prevent conflict. “I don’t think engagement is necessarily completely wrong with North Korea but now is not the time,” he told the committee. If appointed U.S. ambassador to Seoul, Cha’s skeptical viewpoint on engagement may put him at odds with the liberal South Korean President Moon Jae-in, who has advocated a dual policy of strong support for sanctions and increased engagement with North Korea. The Moon administration has played down potential differences with Trump’s “maximum pressure” strategy to impose crippling economic sanctions to force North Korean leader Kim Jong Un to agree to denuclearization talks. South Korean vehicles returning from the Kaesong Industrial Complex, run jointly with North Korea, pass the border village of Panmunjom, in Paju, South Korea, Feb. 11, 2016. Some officials in Seoul mull re-opening the now closed Complex. Industrial Complex, a jointly run economic development project where South Korean companies employed thousands of North Korea workers. Former South Korean President Park Geun-hye closed down Kaesong in 2016 on the argument that money intended for the workers was being diverted to Pyongyang’s nuclear and missiles programs. After meeting with Moon in August as part of a visiting U.S. congressional delegation, Representative Carolyn Maloney, a Democrat from New York, said the South Korean president voiced support for reopening Kaesong as a humanitarian gesture. But so far North Korea has rejected virtually all offers of dialogue and cooperation. “He mentioned that it was a humanitarian thing, whether or not he would advocate it and move it forward, he indicated he reached out for talks and there hasn’t been a response back,” said Rep. Maloney. Cha said in April that re-opening Kaesong would be “unwise” and create a rift with the United States and perhaps even with China that has supported stronger sanctions against North Korea. However Cha shares the South Korean leader’s concern that a U.S. military strike against North Korea would be catastrophic and could lead to war resulting in millions of casualties. On the issue of Chinese sanctions implementation, Cha strongly aligns with the Trump administration’s emphasis that Beijing should bear the responsibility for restraining its key ally in Pyongyang. “China is definitely part of the solution in trying to stop North Korea, but it is also part of the problem,” Cha said in his April congressional testimony. FILE - Trucks move across the bridge linking North Korea with the Chinese border city of Dandong, March 3, 2016. 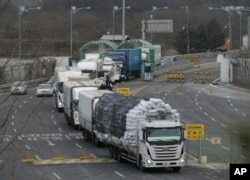 Nearly 90 percent of all North Korean trade flows across its border with China. 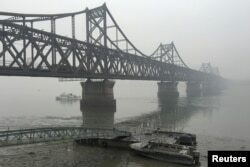 Nearly 90 percent of all North Korean trade flows across its border with China. After agreeing in March to cooperate with China to increase pressure on North Korea, the Trump administration voiced frustration in July with the lack of sanctions enforcement. Beijing is reportedly concerned that harsh sanctions could cause instability at its border, and lead to a collapse of the Kim government and an American allies takeover of the Korean Peninsula. China has repeatedly urged all sides to act with restraint and engage in talks offering economic assistance and security guarantees in exchange for denuclearization. Writing in the Washington Post newspaper in July, Cha called on Beijing to take the leading role in ensuring North Korea compliance by tying trade to denuclearization. “The basic trade would be Chinese disbursements to Pyongyang, as well as security assurances, in return for constraints on North Korea’s program. China would be paying not just for North Korean coal, but for North Korean compliance,” wrote Cha. The United States paid North Korea over half a billion dollars in energy assistance in the past for denuclearization deals that were ultimately broken. Now, Cha says, it should be China’s time to “pay to play” or face strong secondary U.S. sanctions.